PARKING A CAR is difficult in Hackney but some drivers seem to have solved the problem. No rushing around then racing for a space for them, and no need to pop coins into meters. These are the motorists who have found niches around the borough, often near their places of work, and which cost them nothing, while other people find themselves feeding machines with notes or trekking to the council offices to pay fines. 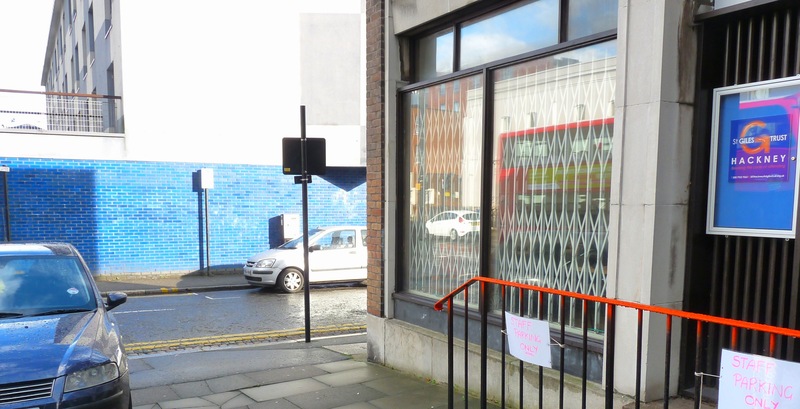 Hackney council wardens say they do not know whether or not they can fine some of the free parkers because of doubts about ownership of the niche spots. Nor do they, they say, have any idea how to remove those doubts. In some cases, as at Winchester Place in Dalston, a warden may try to blitz drivers parking brazenly on double yellow lines a few metres from the high street. But they nip off, returning once the warden is out of sight, wardens have told Loving Dalston. These double-line parkers can be seen chatting with one another, relaxed in the knowledge that they are safe from penalties even as motorists near by are being fined. They have had to desist from parking half on the narrow pavement that runs from Ridley Road Market to Kingsland High Street. Pedestrians and wheelchair users are grateful for that at least. A kilometre north, in Somerford Grove, at the corner of Stoke Newington Road, vehicles park on what may be private land next to a shop. It is hard to see how they get there without driving on the footpath. Driving on a pavement is, like cycling, an offence and police have been asked to investigate. Cars can be seen parked there on most days. The situation is similar in front of the former CLR James Library, now a small-business advice centre. The only way on to the pavement is either over the raised curb or the lowered curb which, if it regularly has to take the weight of vehicles, will become difficult to use for the disabled people and pram-pushers for whom it is meant to give easy passage. Will people wanting to park in Hackney now simply find themselves a wide pavement, of which there is no shortage, and post a sign, reserving spaces for themselves? Certainly, the council evinces no intention of using any of those wide-pavement spaces to make cycling safer in this traffic-ridden city. This is typical Hackney. Charge residents for on-street parking, then fail to fine or remove dangerously parked vehicles on pavements and double yellow lines – making mugs of people who obey the rules. The money from parking is supposed to be ringfenced to enforce the regulations. The council’s strategy document claims to prioritise pedestrians, public transport and cyclists. And yet when the Mayor or council is challenged to act on their own manifesto, all they have is excuses. Try to park on the pavement in the City of London or Westminster. Your car will be gone within the hour. But supposedly the pro-cycling London Borough of Hackney is happy for cars to drive on to pavements. The Mayor and councillors will be asking for votes next year, boasting about their policy document on transport. Some action is needed before they get my vote.